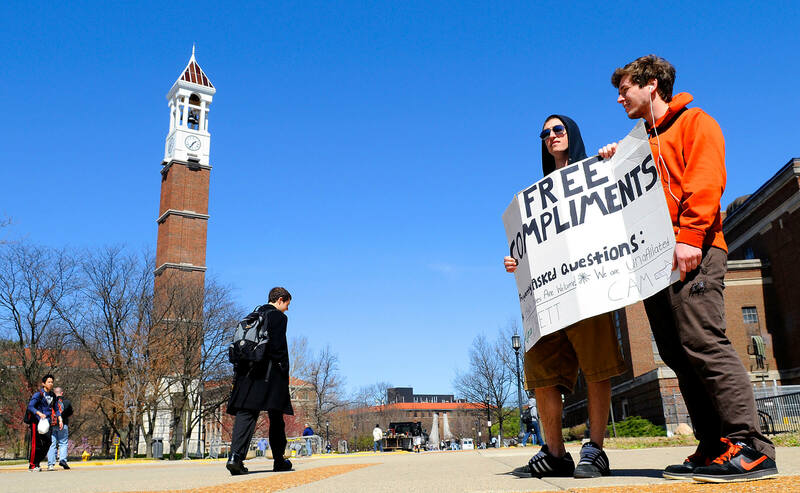 The Compliment Guys, two Purdue University undergraduates whose weekly campus compliment campaign gained international attention, are headed on a 10-city tour to brighten the days of people from New Orleans to New York. Brett Westcott, a junior from Plainfield, Ill., and Cameron Brown, a junior from Toledo, Ohio, kick off their RV road trip on Monday (July 20) in the Big Easy. The tour ends August 7 in Rochester, N.Y. Along the way they will share their adventure online with photos, videos and blogs at https://www.BrightSideTour.com and on Twitter at @ComplimentGuys. "When I started giving compliments on the Purdue campus almost a year ago I never expected it to be so well received all over the world," Westcott said. "This trip will allow us to share the same good feelings with people around the country that we have exchanged at Purdue." Westcott and/or Brown stood at the heart of Purdue's campus for two hours every Wednesday afternoon last school year giving out free compliments to thousands of passersby. Initial suspicion of their motives quickly melted in face of their enthusiasm and earnestness. The Compliment Guys' ability to make people smile prompted Kodak to sponsor the national tour. "There is absolutely nothing else I prefer doing than making people smile," Brown said. "It's amazingly easy to do if you take the very short amount of time to notice what is special about those around you." The Compliment Guys' uncommon courtesy prompted calls this spring from Oprah Winfrey, Jay Leno, Ellen DeGeneres' producers, USA Today, The New York Times, Chicago Tribune, and ABC and Fox News. Their story aired on hundreds of radio and TV stations across the country and in media as far away as Australia and Taiwan. The frenzy was highlighted by a spring break trip to New York, where the two doled out compliments to surprised and mostly appreciative passersby in Times Square during a live telecast of "Good Morning America." "I thought it would end there, but spreading good cheer, especially in uncertain times, is contagious," Westcott said. * July 21: Birmingham, Ala.
* July 23: Charleston, S.C.
* July 24: Charlotte, N.C.
* July 25-26: Washington, D.C.
* August 7: Rochester, N.Y.
Follett's Book Stores in West Lafayette provided the Compliment Guys with Purdue athletic wear for the trip, and Purdue alumni clubs have been invited to meet the guys when they come to a city near them.